Samford University’s Michael J. and Mary Anne Freeman Theatre and Dance Series will present “The Skin of Our Teeth,” opening March 27. Written by Thornton Wilder, the play won the 1943 Pulitzer Prize for Best Drama and highlights elements of the Theatre of the Absurd and improvisational theatre. 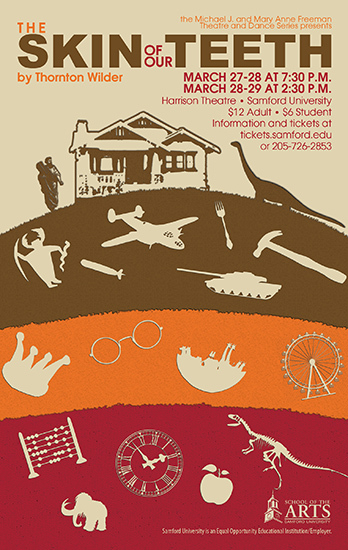 Performances are March 27-28 at 7:30 p.m. and March 28-29 at 2:30 p.m. in Samford’s Harrison Theatre. Tickets are $12 and only $6 for students. The play explores the subject of family against the backdrop of life's great challenges including social change, war and the media, according to Don Sandley, Department of Theatre and Dance chair.